Survival in the face of desperate odds is a theme that Alfonso Cuarón has explored before. His 2006 picture Children of Men is a sumptuous contemplation of the fierce will of humanity to prevail when in a seemingly helpless situation. Whilst Children of Men considered the very existence of mankind, Gravity is a smaller, simpler story on a far grander scale; an examination of the sheer determination to live in an environment where life is inherently impossible. 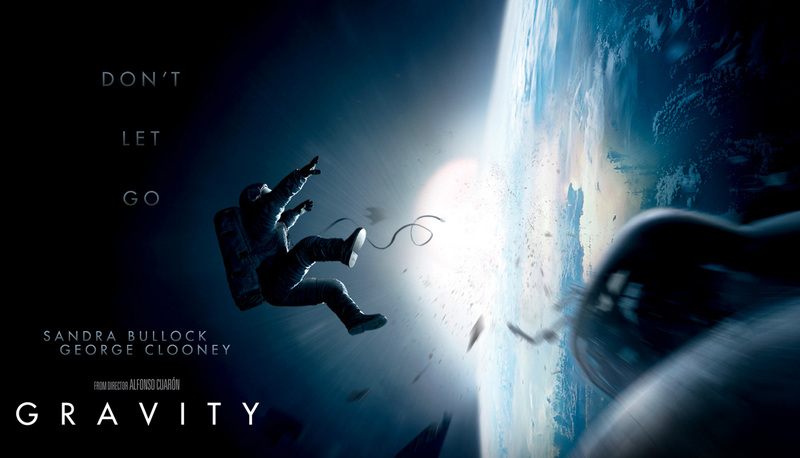 Seasoned astronaut Matt Kowalski (Clooney) and specialist Ryan Stone (a sensational Bullock), on her first shuttle mission, are servicing the Hubble Space Telescope in the tranquility and blissful isolation of space when word reaches them of a cataclysmic debris field that is heading towards them. As Stone and Kowalski negotiate the impending impact amidst incredible tension, they are soon faced with the gravity of their situation and the reality that they are alone, cut adrift and in a nerve shredding fight to survive. With Stone and Kowalski continually confronted with reminders of home (a Marvin the Martian figure and family photos) and with the sanctuary of Earth tantalisingly out of reach despite teasingly looming below them throughout, Cuarón successfully establishes a reason for them to endure. When it transpires that through a familial tragedy Stone had effectively given up on life back on Earth, it’s evident that it’s circumstance rather than environment that determines loneliness and spirit as she constantly grapples with the stark choice of whether to fight or capitulate. It’s through Stone’s internal conflict that Cuarón betrays the very essence of his work; the survival instinct emerges from within rather than without, the compulsion to survive often only revealing itself in the most helpless of circumstances. It’s a neat allegory for humanity and the struggles we all face throughout our lives, but crucially whilst there are nods to spirituality and the soul, it never comes across as sanctimonious or preachy. Bullock is a revelation, her conflicted vulnerability masking an untapped inner strength reminiscent of Sigourney Weaver’s Ripley, whilst Clooney provides the perfect foil as the happy-go-lucky, positive and enthusiastic calming influence even in the darkest of moments. What really elevates Gravity beyond the realms of the simple Hollywood survival story lies in its technical mastery, a glorious realisation of the vast emptiness and hostility of space. Emmanuel Lubezki’s photography is awe-inspiring and immersive, whilst the sound design is effective in establishing the dichotomy of the unfolding peril surrounding Stone and Kowalski and the shattered serenity of space. Gravity truly represents a landmark in not only the visual and aural capabilities of cinema, but also in the manner in which it challenges the established expectation of what a blockbuster narrative can look and feel like. This is an involving, very human story told against a stunning backdrop of unprecedented craft, a true cinematic experience in both the most traditional and most innovative sense of the word.